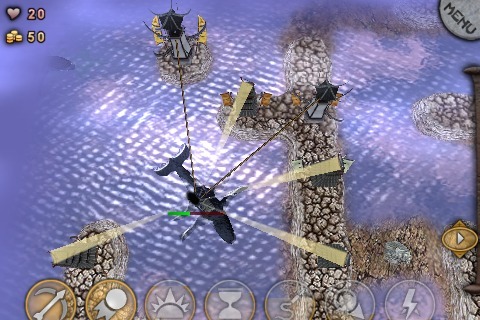 Sweetwater Defense is a 3D-strategy title for iPhone and iPod touch. 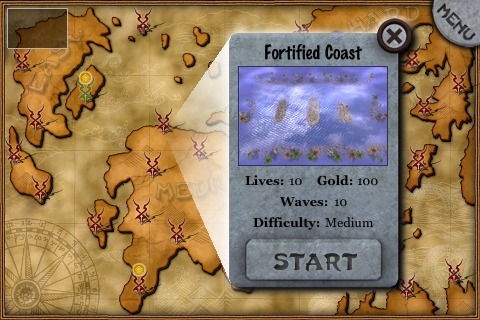 Defend your coastal towns with towers against attacking ships and sea creatures. 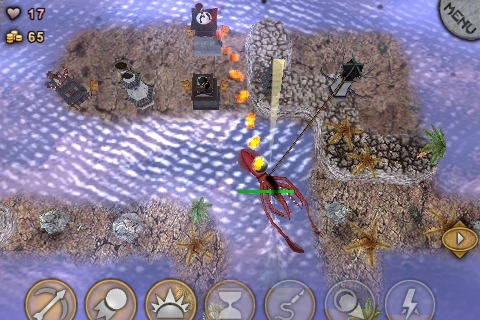 Beautifully detailed graphics with giant sea bosses, 28 different levels and the unique gameplay-changing Rewind feature make Sweetwater Defense a one-of-a-kind game within the tower defense genre. Insanely detailed graphics rendered by our very own 3D-engine make you forget you're playing on "only" a phone. Ever learned in the final wave that your tactic was flawed? Sweetwater Defense let's you rewind and undo your mistakes, adding a puzzle-like quality to the gameplay. More than 20 levels in four completely different tilesets give you fun without end. Three levels of difficulty make the game appealing for everyone from novice to seasoned defender. 11 different enemy classes require all your tactical skill to persevere. Huge bosses force you to combine the different abilities of your towers to stand a chance. Six different musical tracks made by agraphia and Patchwork Mirrors. We are an independent game development studio founded in 2008 by Dominikus Baur, Phil Holzer, Dom Bremer and Sergej Kozuruba. 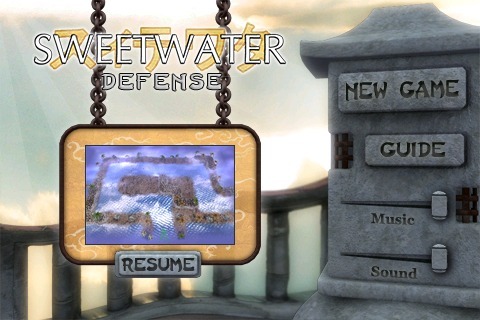 Our game Sweetwater Defense is available in the App Store. Q: The game is way too hard! Is there any way to win? Remember that you can always go back to previous waves using the rewind feature (double-tap on the time slider or shake the device). Towers become stronger if you upgrade them - prefer upgrading to building new towers. Build towers on higher land to increase their range. Cannon and Lightning towers are the strongest towers in the game. Harpoon and Time towers are crucial against bosses - upgrade them to increase the time they're able to stop an enemy. Q: My towers don't attack some enemies! What's wrong? A: There are two kinds of "special" enemies: Submerged and armored ones. 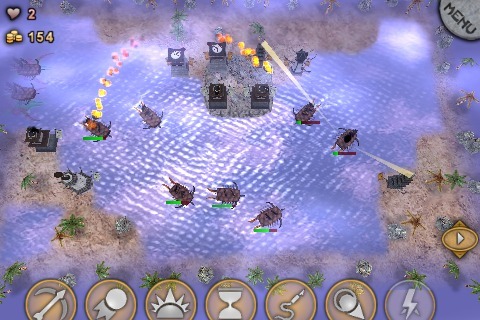 Submerged enemies like the Submarine and the Stingray can be directly attacked by Ballista towers only. 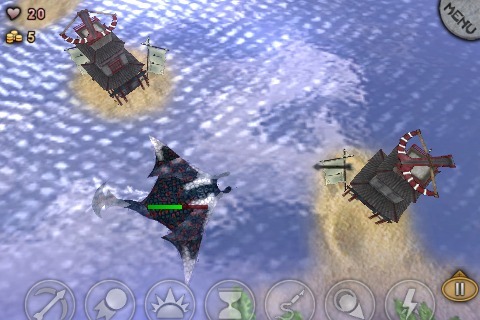 To allow other towers to attack them, you have to build Harpoon towers that force them to surface. 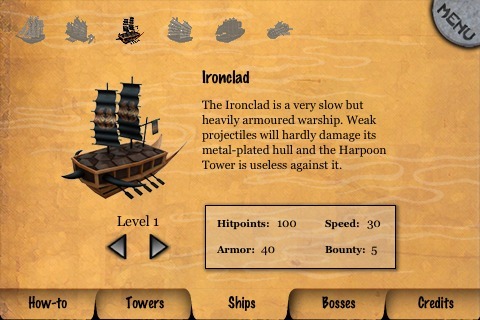 Armored enemies like the Ironclad and the Giant Crab cannot be stopped by Harpoon towers. Try to slow them down using Time towers. Q: Tilting is annoying - can I deactivate it? A: Yes. Open the "Settings" dialogue of your iPhone/iPod touch, go to "SWDefense" and switch "Tilt" off. Q: Where are the music and sound sliders on the main screen? A: You probably deactivated music and sound in the "Settings" dialogue. If you re-activate them there, they reappear on the main screen. Home | Mobile | Imprint Copyright © 2010 Werebear Games. All Rights Reserved.